How long does DDH last? 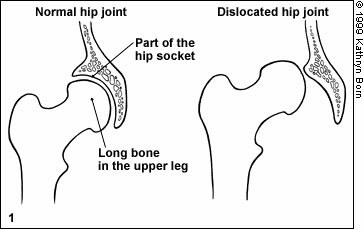 Developmental dysplasia of the hip, or DDH, used to be known as congenital dislocation or dysplasia of the hip. DDH is a common pediatric condition. DDH includes several problems with the development of the hip. Problems can range from mild to severe. For example, in a mild case, a child might have an unstable hip. In a more severe case, a child might have a hip that is dislocated. In these more severe cases, the hip may not even touch the socket where it is supposed to be held in place. DDH is caused by developmental problems while a child is still in the womb. Girls tend to have DDH more than boys. First-born children are more likely to have DDH. This is probably because the mother's uterus is not yet stretched and the baby has little room to move. Babies born in a breech position (bottom first instead of head) are more likely to get DDH. Hip problems tend to run in families. If someone in your family has hip problems, your baby is more likely to have hip problems. Tell your doctor your family history. Usually, DDH affects only one side, the right or left. It is not common for children to have problems with both hips. The right hip is affected in most cases. Infants with DDH often show no signs that they have this problem. Infants with DDH may be hard to diaper. A child with DDH may have one leg that appears shorter than the other. A child with DDH might waddle as he walks. He might have intoeing (toes pointed in) or toe-walking on the affected side. Children with DDH may lean to the affected side when they are standing. Teens with DDH may feel pain in their hip. Newborns should be tested for DDH often. An infant with DDH may have a normal exam. It may not be clear until later in life that the child has DDH. The doctor will probably lay your baby on a flat surface and test one hip at a time. The hip is tested by gently moving your child's leg around while feeling the hip. Some doctors may take x-rays. DDH should be treated as soon as possible. The younger a child is treated, the better the results will likely be. The goal of treatment is to put the hip back in the right position. Your doctor might have you go to a doctor with special training in bone problems in children called an orthopedist. 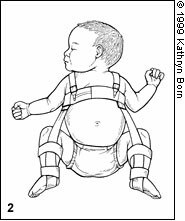 In infants, a harness is often used to hold the hips in place. In some cases, infants will need to wear a splint or brace. As children get older, surgery may be needed to treat DDH. Infants with DDH who are not treated in their first few months may have hip problems throughout their whole lives. This is more likely if the DDH is severe. Keep your appointments with the doctor to have your baby examined, even if he appears healthy. Your child is less likely to have hip problems later in life if he is tested for DDH often and treated as soon as possible. Call the doctor if your think your child shows symptoms of DDH. DDH, or developmental dysplasia of the hip, is a common pediatric condition that includes several problems with the development of the hip. First-born children, girls, and babies born in the breech position are more likely to have DDH. Infants with DDH do not always have symptoms. Some may be hard to diaper. Children may walk with toes pointed in or walk with a waddle. DDH should be treated as soon as possible. The goal of treatment is to put the hip back in the right position. If DDH is not treated, children may have hip problems their whole lives.